Long time Transport 2000/Transport Action member, J. Bakker developed a rapid transit scenario for Vancouver as an alternative to the proposed Broadway SkyTrain extension to Arbutus. He based his discussion on several major infrastructure and political changes that have or will/may occur in Vancouver. The changes are significant enough that he feels a major re-think of rapid transit in the city is necessary. He also comments on the City of Vancouver’s apparent antipathy to Light Rail Transit and the limitations created by the length of Canada Line stations. Mr. Bakker sent his proposals to TransLink and the provincial minister responsible for TansLink, Peter Fassbinder. The responses thanked him for his efforts but were otherwise non-committal. The proposals are presented for discussion and do not represent an official position of Transport Action BC. TransLink Plans should change with new circumstances. The first change is the relocation of St. Paul’s Hospital to a site North of the VIA/Bus station. Transit access to this site is poor and too far away from the Science Centre SkyTrain station. The second change is to remove the Georgia and Dunsmuir viaducts. The third change is the acquisition of the Arbutus Corridor. The fourth change is the destruction of the track between Olympic Village and Granville Island. The fifth change is that the Federal Government will fund half of the infrastructure costs. There is an overload of passengers between Broadway and Downtown. Half or more than half (depending on time of year) of the passengers from the [Millenium] Evergreen Line transfer at Broadway to the Expo line causing the congestion. It is a problem now and will be a greater problem in the future. Students from the East extension of the [Millenium] Evergreen Line are more likely to go to Simon Fraser University. The Canada Line Underground Stations have been under-designed, allowing only one unit trains. It is too expensive to extend the underground stations to lengthen trains to multiple units. While some capacity increase is possible, the Canada Line will not handle the growth forecasted for Metro Vancouver in the future. 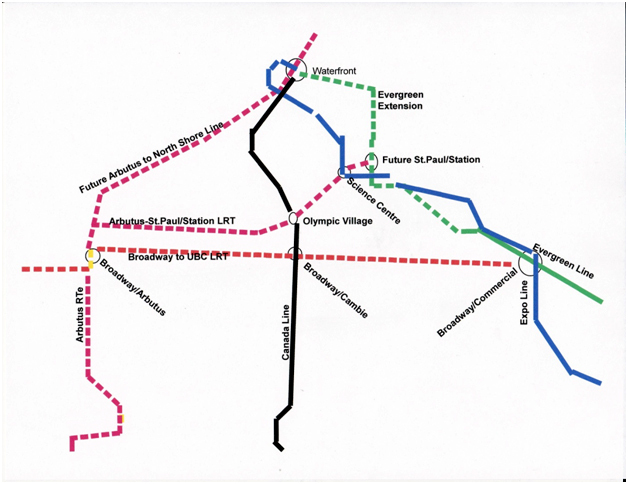 Extend the [Millenium] Evergreen Line from Clark VCC north along the VIA/Bus station (south entrance) and the future St. Paul Hospital (north entrance) and then go via a station at Hastings to Waterfront. Interline the Expo and [Millenium] Evergreen lines at Waterfront. 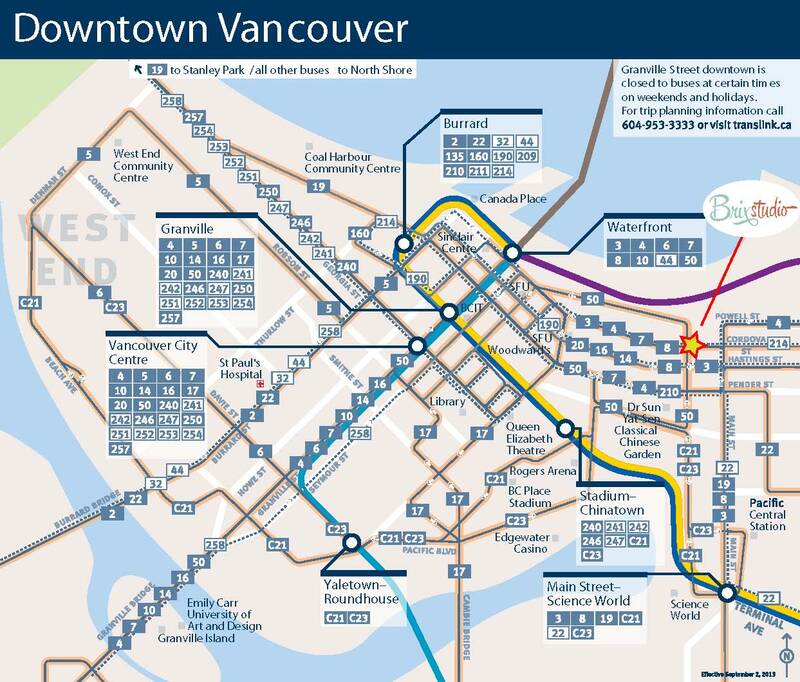 Passengers can then reach downtown (Waterfront, Burrard and Granville Stations) without a transfer at Broadway/Commercial . This proposal will relieve the Broadway to Downtown section of the Expo Line. It will also provide better connections to the SeaBus (one instead of two transfers) and the Canada Line. It would mean that the Broadway Line would not use linear motor technology. If the Broadway line is built underground then it should use the same tunnel dimensions as the Canada Line but with longer stations. However initially a surface LRT line would suffice. The LRT [cost] estimate for a Broadway LRT line was high in comparison to an underground line. I suspect the reason was the requirement of a depot. This depot would take a block or so next to Broadway, an expensive land acquisition. With the purchase of the Arbutus Corridor a better location would be near the North Fraser River. Figure 2. Broadway at Cambie looking West with superimposed green Light Rail. The design of a Broadway Line should be kept simple. Between the Broadway/Commercial and Arbutus, the Broadway right of way is adequate to accommodate a surface Light Rail line. If the line then uses the Arbutus right-of-way to 12 Avenue and then west along 12 Avenue to UBC, costs can be kept down. The stretch between Broadway and 12 Avenue on the former CP right of way is an ideal location for an interchange station with the Arbutus line described later. 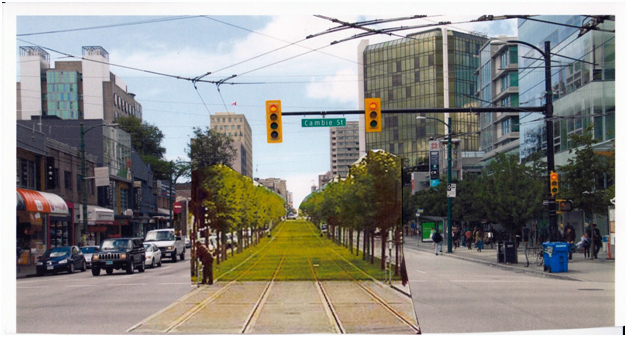 The space used by the LRT should be grassed and landscaped where possible. The traffic signals would control the operations but would have to be retimed. If and when the time comes to go underground, which may occur in stages, and then the infrastructure should be designed for the cross-section of the Canada Line, even if Light Rail units would operate there first. In Brussels staged construction was used. First there was surface line, then portions were placed underground, but tram equipment (or LRT) was still used. When the entire line was underground Metro equipment was used. The process took maybe 40 years. It almost seems that the City of Vancouver views Light Rail technology as a cancer that must be eliminated. In 2010 the City and the Administrators of Granville Island invested $8.5 million for associated upgrades to the infrastructure to upgrade a Heritage Line. The two month operation used two Light Rail Vehicles (Bombardiers Flexity) from Brussels for the operation. The City considered the streetcar demonstration “a tremendous success”, with over 550,000 boardings during the two months of the experiment. Bombardier received an award for “Exceptional Performance and Outstanding Achievement” at the 2010 CUTA awards, recognizing its operation of over 13,000 one-way trips with zero equipment failures, zero station delays and zero injuries. Mayor Robertson tried to purchase the Brussels streetcars, but was unsuccessful. It is astonishing that the City is now destroying this investment. It has removed the overhead wire and is about to remove the tracks. This vandalism shows little respect for the taxpayers’ dollars and it should be questioned if Vancouver really deserves any transit infrastructure investment with this attitude. The excuse is a housing development. Using air rights it is possible, to have both development and to maintain the tracks. However there has to be a will to preserve this path. Unfortunately the city seems to have a will to block any possible Light Rail path. Figure 3. Development above LRT tracks in San Diego. Light Rail will give more rail transit per dollar spend. At this point in time there is a great backlog as to where Rail Transit could be used. Rail Transit has a lower coefficient of friction between wheel and rail, than buses have been rubber and asphalt. Because Rail Transit is electrified it will have fewer emissions than diesel buses. Furthermore because of the rail guidance, productivity can be enhanced by coupling units, particularly in peak hours. To spend billions of dollars because some do not want to see transit and put it underground is waste of scarce dollars at this time. Many opponents seem to be unaware what landscaping can do to improve the visual impact of surface Light Rail Transit. Develop the Arbutus Corridor. Ultimately this line should go to the North Shore, but initially should go to the future St. Paul’s Hospital. When the North Shore portion is built the Arbutus to St. Paul‘s Hospital would become a shuttle connector. 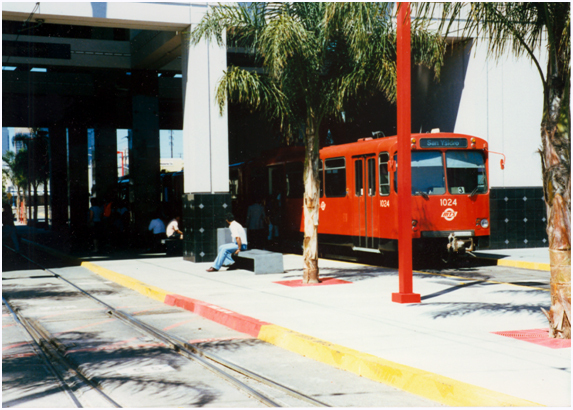 The stations were designed to accommodate one unit trains. To limit the size of stations is astonishing, in light of the London Docklands experience. The London Docklands Light Rail was initially built privately by the Canada Warf Development. They built their stations (on overhead structure) for one unit trains (an articulated car with two sections). I visited the Docklands Light Rail project when it was running under test in 1981. The short stations were the first thing I noticed. In Edmonton the underground stations were built for five unit trains even though initial operations only required two units. I questioned my hosts on it and was told it was a cost saving measure. London Transport for London took over the line soon after start of operations. After a number of years it was found that they needed longer trains and so they extended all stations for two unit trains. Barely completed it was found they actually needed to use three unit train lengths. So they kept rebuilding and extending instead of preparing for growth. The Canada Line this error was repeated, but it is worse because most stations on the Canada line are underground. Extending underground stations means shutting down the entire line for a few years and has a massive reconstruction job. All the station control equipment is located at the end of the platform. There are ways to increase capacity somewhat. The present trains can be replaced with a three section articulated unit. Using the 3 metre spare space on the stations and having both ends protruding in the tunnel, capacity per train can be increased. There is an imbalance in loads between the Airport line and the Richmond Line. Together with the limited ultimate capacity of the Canada Line, a relief line from Bridgeport via the Arbutus corridor is the best alternative. It will also be possible to extend this line further south into Richmond. Right of way should be preserved now. Initially this line could go to the future St. Paul’s Hospital / Station location. However a study should be made if an LRT line can be placed under the Burrard Street Bridge (Space has been reserved for it in the piers), and then underground under Burrard. Such a line should be deep enough so that it can be extended to the North Shore in tunnel under Burrard Inlet. 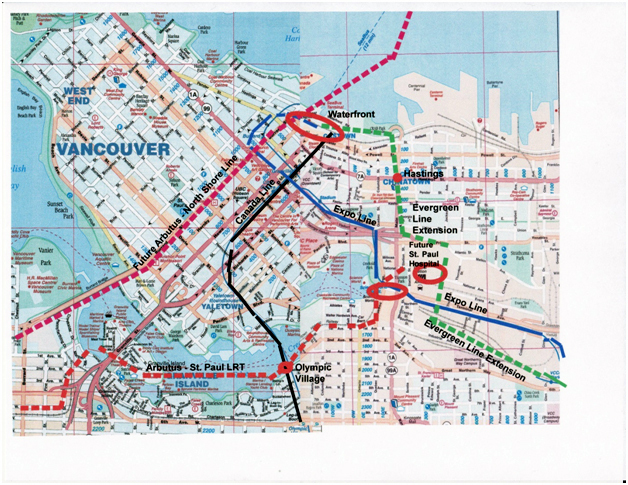 One of the problems with the Canada Line is that it is at the same elevation as the Expo Line at Waterfront and cannot be extended to the North. A deeper station would have made that possible. With the City acquiring the Arbutus Corridor from the CPR, there are opportunities but also dangers. The critical portion is the curvy section between where the CP right-of-way bends away from Arbutus until it rejoins West Boulevard. The city must prevent encroachment of this right-of-way by gardeners and keep this portion available for two tracks of LRT. There is a great opportunity though to combine landscape architecture and the Light Rail line. Such a design should include bike and footpaths with grassed Light Rail right-of-way. Figure 4. 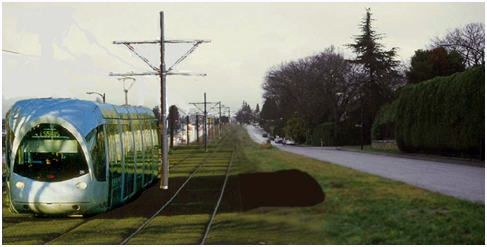 This picture shows a Light Rail unit on a grassed right-of-way in Bordeaux superimposed on the Arbutus right-of-way. In Surrey the transfer between the SkyTrain and the LRT should be made as convenient as possible. Cross platform interchange is the best and could be achieved at King George Station and the proposed line to Langley. The real Transportation solution in the region remains to use cars in areas where there is no congestion and to use transit in areas where there is congestion. The transition is Park – And – Ride. It is unfortunate that TransLink imposed a charge on the South Surrey Park-and-Ride lot. A free parking structure would be a better solution and far more cost effective than a 10 lane bridge. The Fifty Percent Federal Contribution. The increased Federal contribution for Infrastructure from one third to one half should be applauded. However it should mean that more rail transit lines can be built, not that projects should be made more expensive because someone else is paying for it. The purpose of these investments is ultimately to serve passengers, not ribbon cutters. With the many projects being submitted only the cost effective proposals should be considered. J. Bakker was born in The Netherlands in 1929. During World War II he learned what a `no oil’ society was like. In 1946 he went with his parents to the U.K. He went to school in England, graduated from Glasgow University in Civil Engineering in 1954, got his Diploma at Imperial College in 1955 and then went to Purdue University in Indiana. Here he got his M.S.C.E. (Transportation) in 1957. From 1957 to 1959 he was the engineer in Moose Jaw, Saskatchewan. In 1959 he joined the Faculty of Civil Engineering at the University of Alberta where he lectured in Highway Design and Public Transportation. He took early retirement in 1991 but stayed on half time until 1994. He also served ten years on the Council of St. Albert. In that time period it was taken from near bankruptcy to a thriving, financially sound community with controlled growth. During his career, he consulted on Transit Networks and Timed Transfers with many Transit Systems. He was an advisor to Edmonton Transit and was involved in the construction of Edmonton’s North-East LRT line – the first North American Light Rail Line built since World War II. He set up the transit systems of St. Albert and Sherwood Park. In 1995 he was sub-consultant to Dillon Consulting Engineers and recommended the diesel LRT (O-Train) in Ottawa. Transport Action British Columbia’s Annual General Meeting will be held this month on Thursday December 10th. The AGM will occur first, followed by the regular meeting immediately after. We will meet in the small meeting room on the right when you come in from Howe St. It seat eight, but there is room for some more chairs. This proposal for transit linking Broadway/Commercial SkyTrain station to UBC was sent to us from Adam Fitch. It was posted to stimulate discussion about transit options for the Broadway/UBC corridor and doesn’t represent the views of Transport Action BC. The cost estimates are ballpark and don’t reflect some of the estimates done in more rigorous studies. 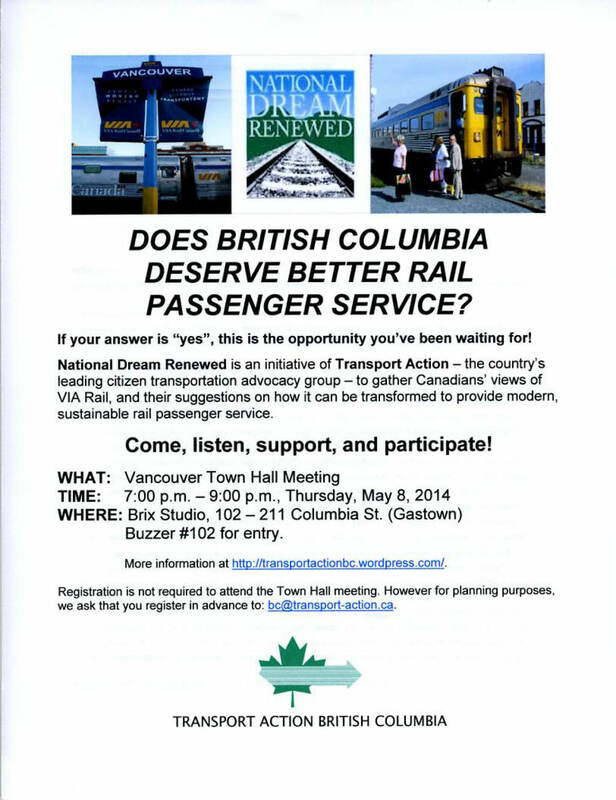 Harry Gow, president of Transport Action Canada, will be leading a town hall meeting in Vancouver. We had to re-schedule the AGM originally scheduled for the spring to fall.